These Cartoons Totally Nail Postpartum Depression. Within a few days of my first child’s birth, postpartum depression and anxiety rolled in like a choking fog. I was brimming with unmet needs: the need to sleep, the need to silence the jagged thoughts that ran like a ticker tape through my head, the need to not nurse every 20 minutes, the need to believe that increasing the dose on my antidepressants wasn’t going to damage my baby, the need for someone to tell me I wasn’t an instant failure at motherhood. And yet, I couldn’t articulate any of these needs. Being a new mother felt like being in an altered state: my hormones plummeting, my body bruised and bleeding from a sustained and difficult birth. I was suddenly sleepless—and also in charge of caring for a tiny human being. My mind careened with pulsing panic and a thick, tarry sense of hopelessness. One of the most challenging parts of having postpartum depression was not even being able to discern what I needed. My new baby was helpless physically—and I felt emotionally helpless. I knew going into my pregnancy that my history of depression and anxiety meant I was at a significantly higher risk of having postpartum depression. But even knowing that didn’t prepare me for the shame I felt when it struck. I was mortified by the thoughts I had of harming my beautiful baby boy, by my desire to magically return to my old, pre-parenthood life, by the fact that what was supposed to be “one of the best times of my life” actually felt like a nightmare. If that wasn’t all enough, I also felt the pressure to be need-less—I’d internalized the beliefs that mothering should feel natural, our babies’ needs should eclipse our own, and needing help was a sign of motherly failure. 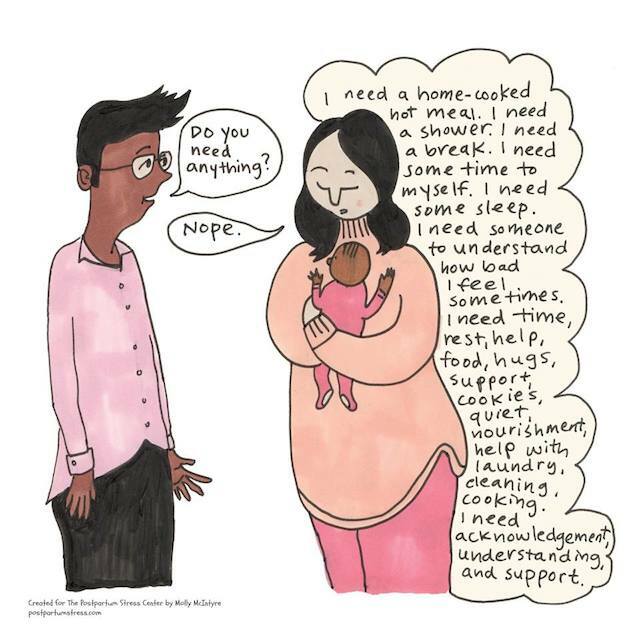 That’s why these comics, created by artist Molly McIntyre and Karen Kleiman for The Postpartum Stress Center, are striking a chord with women who’ve experienced postpartum depression and other perinatal mood disorders. These comics are part of The Postpartum Stress Center’s #speakthesecret campaign, which aims to strip away the stigma surrounding perinatal mood disorders and empower women to understand that the difficult thoughts that often accompany these disorders aren’t something to be ashamed of. The campaign plans to roll out more comics over time. In addition to the comics, another aspect of the #speakthesecret campaign is a webpage with a rolling list of “scary thoughts” that new moms have. 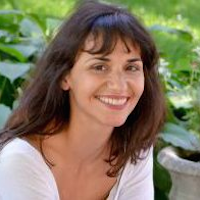 Karen Kleiman, expert and author of several books on perinatal mood disorders and founder of The Postpartum Stress Center, defines “scary thoughts” as the upsetting, intrusive, reoccurring thoughts and images many new moms experience. Reducing the stigma surrounding perinatal mood disorders and creating safe spaces for women to share their experiences helps us realize that we’re not alone, we didn’t choose to have postpartum depression any more than we’d choose any other disease, and that with time and treatment, we’ll get better.